On Tuesday, November 20, 2018, H.E. Archbishop Moushegh Mardirossian, Prelate, welcomed the visit of H.E. Bako Sahakyan, President of the Republic of Artsakh, and H.E. 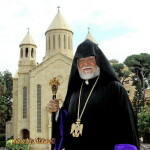 Archbishop Barkev Martirosyan, Primate of Artsakh, who had traveled to Los Angeles to participate in Armenia Fund’s 21st International Telethon on Thanksgiving Day. The honored guests were accompanied by Mr. Davit Babayan, Deputy Head of the President’s office, Mr. Haykak Arshamyan, Executive Director of Hayastan All Armenian Fund, Mr. Robert Avetisyan, Permanent Representative of the Republic of Artsakh to the United States Mr. Armen Baibourtian, Consul General of Armenia in Los Angeles, and Consular staff. The Prelate was joined by H.G. Bishop Torkom Donoyan, Vicar General, Central Executive members Mr. Vahe Yacoubian and Mr. Gaidzag Zetlian, Religious Council, Executive Council, and Ladies Auxiliary members, as well as Mr. and Mrs. Sarkis and Nune Sepetjian, Dr. Mike Sarian, and Mr. Gevik Baghdassariann, sponsors who have contributed generously to Artsakh. The visit began at the “Sulahian” reception hall. The Prelate greeted the honored guests and affirmed the support of the Prelacy and all Armenians to Artsakh’s prosperity which must be carried out with more transparency. After expressing thanks for the warm welcome and continued support of the Prelacy, President Sahakyan stated that efforts toward the defense and security of Artsakh continue step by step and with the perseverance and commitment to overcome any challenges. 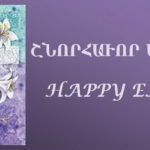 He added that the people of Artsakh appreciate the support and aid of all Armenians, noted that the accomplishment of the past act as a stepping stone for future endeavors, and expressed contentment for Armenia Fund’s new and competent director with whom they are drafting new projects. Archbishop Martirosyan also thanked the Prelacy family for their warm welcome. On behalf of the Executive Council, Chairman Mr. Garo Eshgian welcomed the guests and expressed his wish for future telethons to focus also on providing aid to the families of soldiers. President Sahakyan stated that those defending our lands are a priority for the government of Artsakh and Armenia Fund, adding that soldiers and their families receive special care and support which extends beyond the telethon. In addition to monetary support, they also receive medical care from visiting medical missions, whom he commended. A dialogue followed on the ongoing projects and needs of Artsakh. 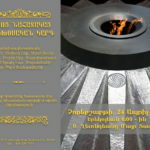 A luncheon followed at “Dikran and Zarouhie Der Ghazarian” Hall. Following the invocation by the clergy, the Prelate conveyed well wishes for the peace and stability of Artsakh and strength to its leaders. Well wishes were also conveyed by the Vicar General, Executive Council Chairman, members, and sponsors. The Consul General and Executive Director of Hayastan All Armenian Fund conveyed their thanks and appreciation. Following the remarks, the Prelate one again welcomed the guests, affirmed the support of our churches and schools to the telethon, and invited President Sahakyan to convey his message. President Sahakyan stated that naturally Armenians living outside of Armenia maintain their bond with our homeland and lending a helping hand as needed. “Though we have had loss of lands in the past, we are committed to defending our lands and liberating that which is rightfully ours. 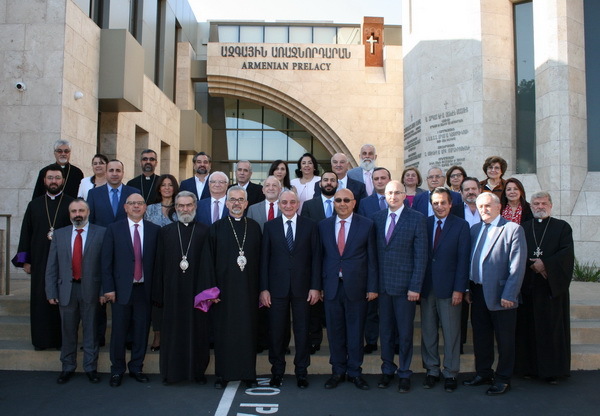 Serving the homeland brings a sense of fulfillment and joy to each Armenian, and we express our gratitude to His Holiness Catholicos Aram I, Archbishop Mardirossian, and all the Prelates who lend their support to the mission of nation-building,” concluded the President. The luncheon concluded with the benediction led by Archbishop Martirosyan.